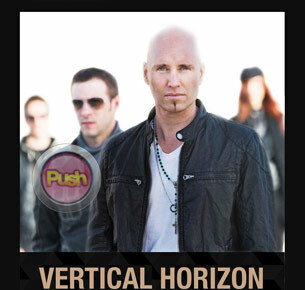 US-based band Vertical Horizon returns for a one-night only concert in their third visit to the country. 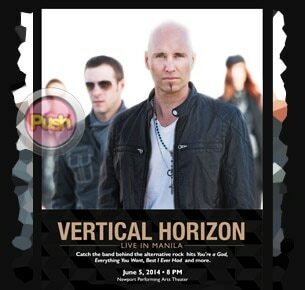 Vocalist Matt Scannell shared with the audience how their band felt about being in the Philippines again. ”Masaya kami andito kami ulit sa Pilipinas. We are very, very grateful to be here. So grateful. I don't know if you realize this but you have a good thing going on. We travel all over the world and we see all kinds of people and the Filipino culture, the Filipino heart is very big. It is. It's special. We travel here all the time but I don't mind telling it you again. Sincerely it is a pleasure to be back,” he said during the concert held at the Newport Performing Arts Theater in Resorts World Manila. Before singing their song “Forever,” Matt also admitted how affected he and his bandmates were when calamity struck the Philippines late last year. “I wrote this song for a dear friend who passed away and whom I miss very much and I want to play this for all the victims of Typhoon Yolanda. When it was happening, we were back in the States and we were hearing about it and our hearts and our prayers were with all the Philippines. We played in Cebu before and it was an incredible place and I'm sure it's coming back and we just want all those people to know that we think about them and we send them our love and our thoughts and our prayers. So if you’re missing someone tonight or if you just want to send the love out there to the world this is a song for them,” he explained. The concert was an intimate and laidback affair with no frills or special effects that highlighted the music of the band which has been in the industry for almost two decades now. The simple presentation also complemented the band's musical style which Matt explained is their writing style as well. “We're happy you have us back here. As songwriters, we are supposed to write songs about things, about deep and meaningful issues, world peace, stuff like that. And a lot of people do that and maybe I even do that every once in a while, but sometimes I don't do it at all. In fact, this next song is about absolutely nothing and I'm okay with that,” he admitted. One of the highlights of their trip to Manila according to Matt was the food he gets to enjoy whenever he is here, with special mention going to the halo-halo. “Wherever I go in the world I am not going to get halo-halo the way that you guys do it. If I go back to New York city or Boston, Massachusetts where I grew up. We don't know how to make halo-halo so I think more Philippines journeys need to happen. The kind staff treated us to amazing Filipino meal tonight. Oxtail soup, the lechon, crispy pork knuckles, the pig doesn't stand a chance does it? (laughs). The pig doesn't really stand a chance because it's just too damn tasty. They gave us halo-halo for dessert and we were going, 'Oh man this is so good,’” he said. During the hour and a half performance, Matt would entertain the crowd with little anecdotes or realizations about his career which made the concert look even more intimate. “I grew up in a seaside town in the summers when we'd go to the ocean and the place in Massachusetts is called Cape Cod. It's very far from here (laughs). And let me just say that for the record when I was growing up in Cape Cod I wouldn't have even dared to have dreamed that I would be able to play my songs in Manila, in the Philippines. So you have to know what an honor it is for us that it is our third time here. Thank you very much,” he said.